In the center of this approx. 300-miles (such as about 482,802-Km) wide image of Pluto, taken by the NASA - New Horizons Spacecraft on July, 14, 2015, we can see a large Region of jumbled and broken Terrain which is located in the North/Western edge of the vast, Plutonian Icy Plains informally called Sputnik Planum (and visible to the right - Dx - of the frame). The smallest visible Surface Features here, are approx. 0,5 miles (such as about 0,80467 Km) in size. This image was taken from a distance of approx. 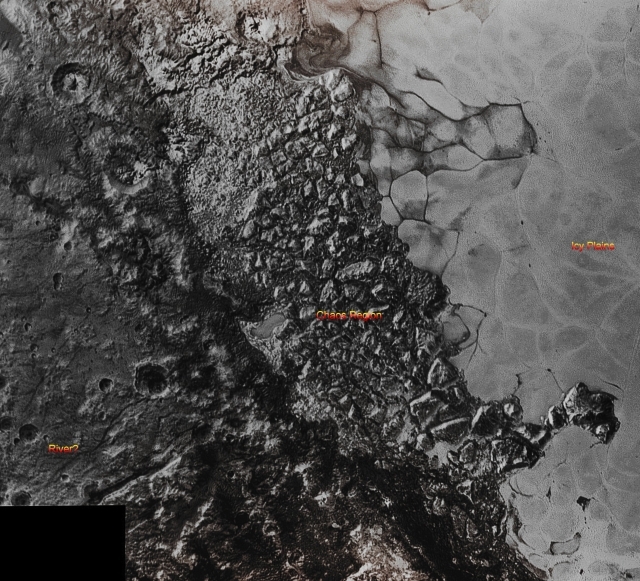 50.000 miles (such as roughly 80.467 Km) from the Surface of Pluto. Other interesting Surface Features - besides the abovementioned Chaotic Region and the Icy Sputnik Planum - can be seen in this fascinating frame. Above all, we, as IPF, wish to draw your attention to a sinuous and Complex Valley-like Feature which appears VERY similar to the Rivers of Methane that we have already seen flowing on the Saturnian moon, Titan. We indicated just one of them, but other, and similar, Valley-like Features can easily be seen, here and there, towards the left (Sx) side of the picture. So, what do you think of them? Could they actually be Rivers filled-up by (still) Liquid Hydrocarbons? Think about it...and write us, if you wish, at alphacentauri@intercom.it . The image (which is an Original NASA - New Horizons Spacecraft's b/w and NON Map-Projected frame published on the NASA - Planetary Photojournal with the ID n. PIA 19934) has been additionally processed, magnified to aid the visibility of the details, contrast enhanced and sharpened, Gamma corrected and then colorized (according to an educated guess carried out by Dr Paolo C. Fienga-LXTT-IPF) in Absolute Natural Colors (such as the colors that a normal human eye would actually perceive if someone were onboard the NASA - New Horizons Spacecraft and then looked ahead, towards the Dwarf-Planet Pluto), by using an original technique created - and, in time, dramatically improved - by the Lunar Explorer Italia Team.